A good tattoo stencil machine should be in any serious tattoo artists’ arsenal. 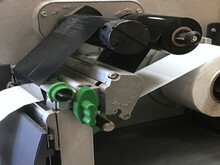 The whole idea behind a thermal printer is to allow the artist to draw a design using some transfer paper, which is then fed into the printer and produces a copy of the design that can be placed directly onto the skin. Using a thermal machine eliminates the hassle of marking up a design on a client’s skin only for them to ask for it to be moved up, down, or even removed. With a stencil maker, you have the ability to adjust the design on the client’s skin simply by moving the stencil around, with it also ensuring that ​there are no errors in the original design when you’re ready to ink. 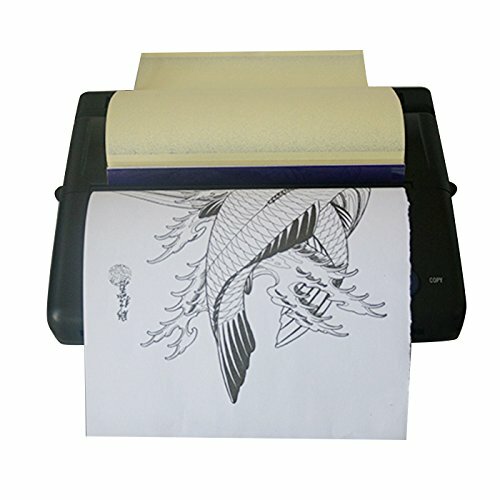 These devices are without doubt essential if you’re dealing with a lot of clients or customers, although they are still very popular even with casual tattoo artists. One thing that can be said about these machines is that they are not cheap to buy. They are very costly compared with other tattooing equipment, so if you’re on a tight budget, then you can’t afford to be buying the wrong model. This is why we’ve put together with our tattooing knowledge, a collection of the best 5 tattoo stencil machines available to buy today on the market, to ensure they you don’t burn a hole in your budget with the wrong model! What Makes A Good Thermal Copier? The number 1 choice on our list goes to the well-renowned brand in the tattoo industry – Dragonhawk and their black ZY003 thermal printer. 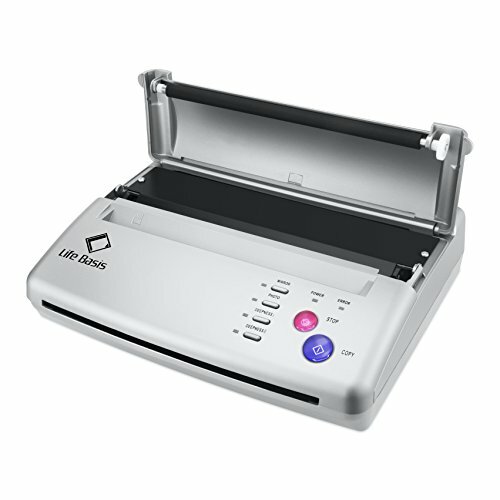 It has a scanning and printing width of 210 mm and takes a document size of A4-A5. The temperature that this model works under is 5-35 degree and measures in at 290mm wide x 280 depth x 80mm high. What stands out with this printer is the range of settings and options that it offers the artist. It offers 2 levels of deepness which is perfect for either heavy or fine line. 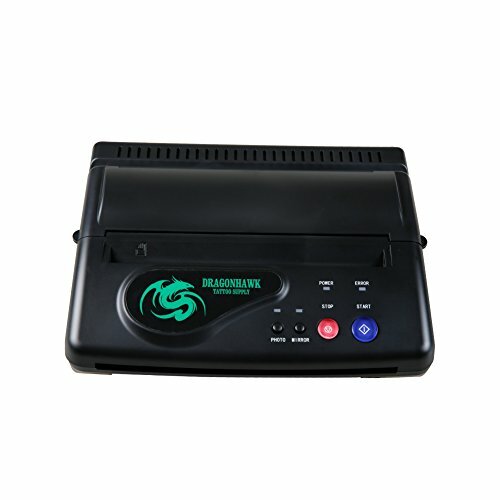 The machine is ideal for traveling also, thanks to the fact that it is 110v and 220v compatible which means it can be used all over the globe. An error light is also present on the machine that indicates if there is a problem with it. Say for example that the thermal printer starts overheating then the error light will turn on to let the user know there is a problem. Even although this our top pick, it doesn’t come without its flaws. One thing that can be off-putting is the fact that it’s a little tricky to work out how to use at first. For first time users, it may be a little overwhelming and confusing with the settings, which isn’t helped with the poor instructions that are provided with it. Overall it’s manufactured by one of the most trusted brands in the inking industry and screams out quality that’s designed to last. 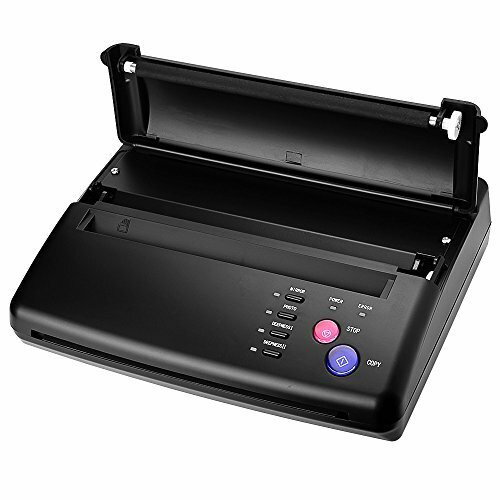 It’s a great portable stencil printer that’s ideal for traveling and carrying around with you. A little tricky to get used to at first and may need a bit of playing around with. This stencil maker is marginally more expensive than some of the other models listed in this review, though we can’t deny that it’s worth the full price tag. The runner-up on our list comes from the lesser-known manufacturer Life Basis. The actual machine weighs in at a very light weight of 1.17kg and is able to take paper sizes A4-A5. It has the typical settings that these machines usually come with – normal and mirror copy, with two deepness settings also. With your purchase, you also get 10 sheets of transfer paper for free, as well as a 2-year warranty for some peace of mind. What we especially like with this Life Basis model is that it is very economical. 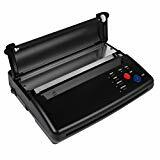 It has ​fewer parts to it than a standard thermal copier, and does not include any of the heating elements that you would normally see and cause it to overheat. It has a fair amount of settings available and 600 digital patterns to choose from. It’s relatively easy to setup and use, and doesn’t need you to have an expert level of tattooing experience to work. The weight is also very light and desirable, allowing you to take it on your travels. Although this does seem an all-around perfect stencil machine, it does have a few things that keep it from taking the first spot. Firstly, the quality of stencils it produces is good, but it isn’t quite as good as our number one choice. The model can sometimes be a bit of a hit and miss in terms of quality with some users, although generally, the majority of people get good results with it. This choice is also one of the more expensive models listed, although it does come with 10 sheets of transfer paper included. Overall a solid out-of-the-box choice, that includes everything you need to get started right away without having to splash out on extras, although it is a little more expensive than other models. If you’re looking for the best quality of printing you can get, then we would recommend our number choice over this. Still coming in at a respectable third place on our list comes with the manufacturer Hommii. This model weighs in at 1.8kg, has a scanning and printing width of 210mm, takes A4-A5 sized paper and comes with a stand US power cable. What we liked about this model is that it’s designed perfectly for outlining. It’s very effective at printing outlines and works effortlessly. It’s very simple to get going and doesn’t require any expert knowledge or special instructions to work. It has all the usual settings that you come to expect from a thermal copier, as well as having status lights. Although we have recommended this model for outlining tattoos, we wouldn’t recommend it for more complicated images and pictures as it just doesn’t handle it well. 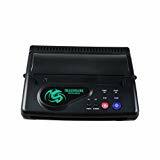 Overall the absolute best tattoo stencil machine for outlining. If you don’t need to print more complex images and pictures, then this should be your choice. Its light in weight, has all the settings you need, comes with everything to get going out of the box, is easy to use and is priced fairly. Atomus who offer a fairly large selection of tattoo supplies on the market makes it onto our list with their model. This pick has all the standard specifications of the other models listed, but does come in at a modest 1.67kg. You get everything you need to get going straight away with your purchase, as it also includes 1 transfer paper with the purchase. What impresses us most about this pick is the actual quality of the printing. Although this is slightly cheaper than some other machines mentioned here, the quality of printing is that of a higher-end, more expensive model. It has an ideal weight for carrying around and with the added bonus of 1 transfer paper for the price. Something that you need to look out for with the Atomus model is for fakes. ​There are lots of fakes going around that are pretending to be the real brand, but in actual fact offer a low-quality printer that’s guaranteed to break. Overall a decent pick that has a lot to offer in terms of quality at a very competitive price. The big issue with these models is buying a fake as there are lots of them around on the market. Be sure to check you’re buying a genuine model first. Our last choice comes from a manufacturer that offers a little bit of everything – Zinnor. It sports all the standard specifications that you’ve come to expect from a good stencil machine. It has all your usual buttons for the different functions such as changing the deepness and resolution. This model made our buying guide by the skin of its teeth. The quality of the printing is good, nothing more than that. The actual quality of the coper is decent and is designed with ABS material which makes it environmentally friendly and long-lasting. This copier doesn’t overheat and creates very little noise when printing which can also be appealing to potential artists. Although it offers a good level of printing, that’s about as much as you’re going to get out of it. If you’re looking for a better quality of print for more detailed designs, then we wouldn’t recommend the Zinnor. Another negative point is the price. It’s very expensive compared with the other choices we have on this list and even other similar models on the market. Overall a no thrills pick that has a little bit of everything to offer and does the job to an ok standard. It is a durable machine and should last the tattoo artist a number of years, although the price tag that it carries and the quality of printing, may put you off it. The most important thing to consider in a stencil copier is the printing quality that it offers. Because these bits of equipment are not cheap, the last thing you want to do is spend all your money on something that produces poor prints. Depending on what you’re using the transfers for ie. Styling, shading, etc. you’ll want a model that can follow and print the full design without missing parts of it. All the machines that we listed pretty much have the same settings across the board with a few variations here and there. All our top choices have the settings you would typically look for such as deepness, mirror and normal copy etc. They all also have an error light which indicates if there’s a problem with the copier such as it overheating for example. Watch out for some cheaper stencil machines on the market, as they don’t have these settings. Some models, especially cheaper ones, are prone to overheating when printing due to the poor quality of materials used to manufacture them. You don’t want anything that uses hot bulbs or rods inside them, as any sort of moderate usage will cause it to overheat. If you’re an artist that does a lot of traveling around the country to visit clients and ink some tattoos for them, then you’ll want a machine that’s not going to weigh a complete ton to carry around with you. Something that can be packed away easily in your tattooing bag and transported anywhere you need is very desirable. All the picks on our reviews list are of a reasonable weight and are ideal for being transported. Be sure to check out the full weight of any machine you’re considering buying before purchase. Sometimes the settings that these machines have can be overwhelming for a novice or even expert tattoo artists, which is then made even worse by the poor documentation that most manufacturers include. As most settings are standard across the board, most models have the same level of difficulty as each other when operating. If you travel around then providing you have a light copier, something that you can setup quickly and get printing from straight away is vital. Stencil machines are not cheap to buy, that’s for sure! But hopefully we’ve guided you along the right path when looking to choose the best one for your tattooing prints. We selected our top 5 picks with quality and value for money at the forefront of our mind. We’ve established that a stencil maker is a great piece of equipment for any serious tattoo artist that deals with clients on a regular basis, just make sure you spend the time to browse around and pick up a model that’s up to the challenge.